In the past, we've discussed many technology changes within the property management industry. These changes in general reduce a manager's workload and help facilitate that need for something "instant." Instant and online screening are good examples of where technology has stepped in. Examples of instant tenant screening are programs built within property management software or where a user goes to a certain website and receives the results within seconds. Online tenant screening is another example. It's instant. The faster you approve a tenant, the less likely that he or she will continue shopping, and the faster that you can get a firm commitment. A full record search can usually be done within a business day, but sometimes can take longer. Some tenants don't want to wait a couple of days to learn the results. In almost all cases, it's cheaper and the property manager could choose to charge a lower application fee or choose to make money on applications. Allows the property manager to say that a national background screening check has been conducted. The credit portion of these are accurate, just not the criminal part. According to Acranet, only 8% of the criminal records returned are valid after verifying the records with the courts. Nearly 70% of criminal records in the US are at lower court levels and thus not available through a "National Search." A county or state search is the only sufficient option for 30 states in the US. User could actually deny an applicant because the instant report got it wrong, whereas the other companies that go to the courts to verify would have caught the mistake. 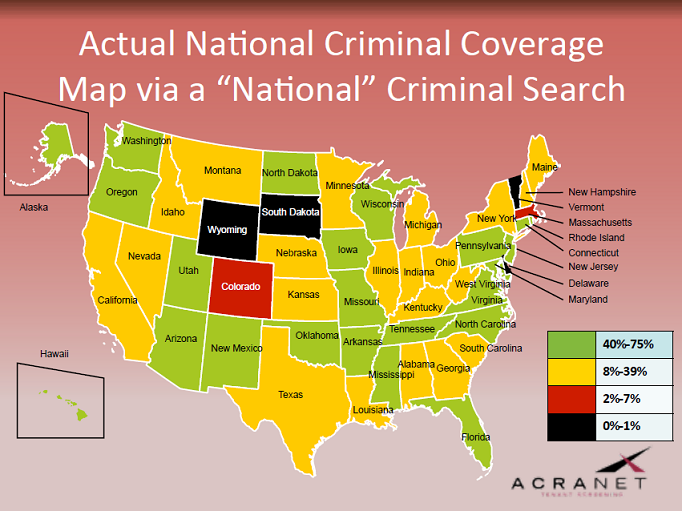 I keep putting "national" in quotes, because that's the buzz word you hear, but as the below map demonstrates, the instant "National" criminal search is a bit lacking. It's the perfect answer for those who want to say they do a national criminal background check, but if they, their clients and their clients' hazard insurance carriers are expecting a thorough criminal background check, these type of searches are not the answer. 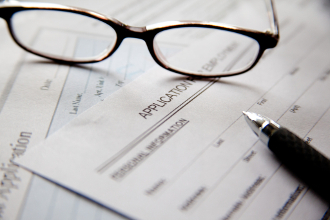 First Rate Property Management doesn't discriminate against any protected class, but for the safety of everyone, we do want to discriminate and deny applications that fail to meet our criminal history criteria. I chose the title, Instant Tenant Screenings Are TV Dinners, because when I look at the results, I see a TV Dinner on one side and a nice, charbroiled steak from my favorite restaurant on the other side. You know, just about everyone who knows me says that I am a technology junky. I realize that I am getting older, but it just seems as though, time after time, First Rate Property Management is choosing against these technology changes, because we don't believe that the money and time savings -- nor the ability to meet instant expectations -- is worth the risk to us, the property owner or the surrounding neighbors.